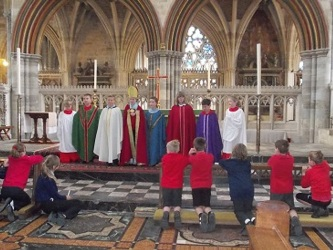 On Thursday, 19th May 2016,Class Two children from both Bradford and Black Torrington Primary Schools visited Exeter Mosque and Cathedral as part of their RE work. 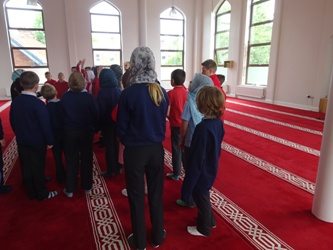 The children weretaken on a guided tour of the mosque, seeing the washing areas, prayer hallsand having the opportunity to ask questions about the Muslim faith. After lunch on the Cathedral Green, theytook a guided tour of the Cathedral, focusing on the artefacts used in worship.Some of the children dressed up in cathedral vestments or choir boy / girl clothes.There was then an opportunity to sing in the choir stalls and take a moment toreflect on their own journey through life.